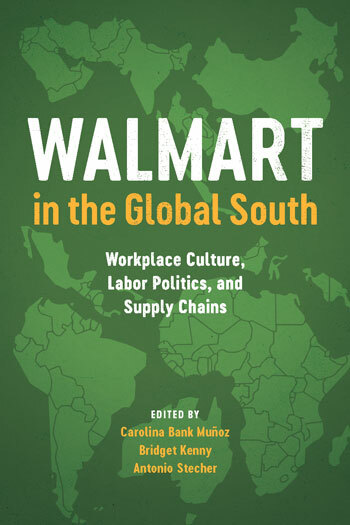 Walmart in the Global South. Workplace Culture, Labor Politics, and Supply Chains. Edited by Carolina Bank Muñoz, Bridget Kenny,and Antonio Stecher. University of Texas Press. “As the largest private employer in the world, Walmart dominates media and academic debate about the global expansion of transnational retail corporations and the working conditions in retail operations and across the supply chain. Yet far from being a monolithic force conquering the world, Walmart must confront and adapt to diverse policies and practices pertaining to regulation, economy, history, union organization, preexisting labor cultures, and civil society in every country into which it enters. This transnational aspect of the Walmart story, including the diversity and flexibility of its strategies and practices outside the United States, is mostly unreported.